It’s a bird… It’s a plane… No wait! It’s Mecha King Ghidorah! Mecha King Ghidora joins S.H.MonsterArts in spectacular form like you’ve never seen before, with advanced articulation and out of this world detail. Mecha King Ghidora stands tall at an impressive 25cm and precisely placed ball joints in the neck and tail allow for unrestricted posing possibilities. The machine hand on Ghidorah’s mechanical torso armor is interchangeable and perfect for posing with your favorite classic S.H.MonsterArts Godzilla. Use of die-cast material adds to the authentic look. In addition to the machine hands, set includes three adorable Dorats and special display stand and support parts. This Tamashii Web Exclusive will be available Bluefin supplied N. American retailers. 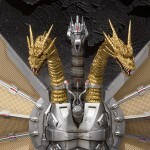 Don’t forget to check out the photos of the SH Monsterarts Mecha King Ghidorah. Another Tamashii release coming to the Japanese market in February 2015 is the SH Monsterarts Mecha King Ghidorah. This figure will also be a limited web shop item. The mechanized version of Monster Zero looks pretty fantastic and comes with a load of features and accessories, which work well with their previously released Godzilla SH Monsterarts figure. The 250mm tall (almost 10″) figure will sell for 19,440 Yen (about $187 USD). 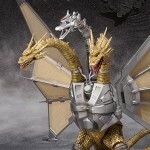 It also includes three Dorats, from the 1991 movie Godzilla vs. King Ghidorah. The Dorats were mutated by a nuclear blast that caused them to fuse together and become King Ghidorah.